BUSCHMAN STORE™ IS THE ONLY AMAZON SELLER WHICH IS AUTHORIZED TO SELL BUSCHMAN FURNITURE. DON'T RISK PURCHASING BUSCHMAN FURNITURE FROM OTHER SELLERS BECAUSE OF INCREASED SIGHTINGS OF COUNTERFEIT LOW-QUALITY ITEMS. 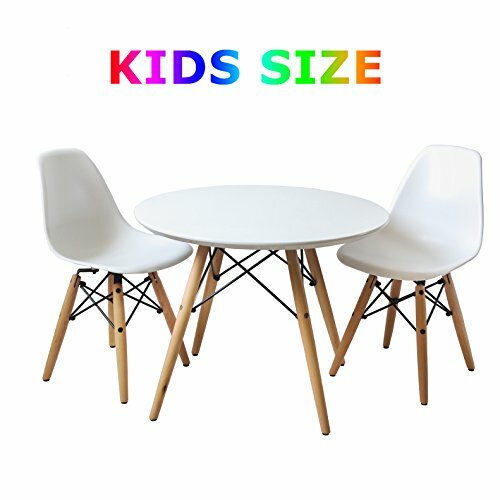 This versatile set of two white, kids Eames-style playing chairs and a table is perfect for a young adventurer's space in a modern home; or a forward-thinking business looking to upgrade its facilities or client-facing waiting areas. A perfect example of a modern kids chair, these spotless white armless seating options are sturdy, incorporating wooden legs and a wire metal Eiffel dowel base, and easy to clean, as they are crafted using HQ polypropylene, a non-toxic molded plastic. Seating such as this goes well with a variety of interior design themes; whether the rest of your room makes use of dark woods or lighter metals, these chairs and table should fit right in with your home overall appearance. The quality of these mid century playing chairs and table cannot be emphasized enough – each seat is provided with a matte finish, and is tested comprehensively at the factory. Features: - Durable enough for use in the waiting area, and stylish enough to use at home - Each chair has solid wood legs backed by steel reinforcement - Protective tips for sensitive flooring - Ergonomic shape and curved seat - Powder coated steel base Specifications: Recommended for 3-8 years Chairs: Weight Limit: 175LB Seat Height: 12.2" Chair Weight: 3.75LB Overall Dimension: 10.6"(L) x 10.6"(W) x 22.4"(H) Table: Table top diameter: 23.6" Table top height: 20.5"
If you have any questions about this product by Buschman, contact us by completing and submitting the form below. If you are looking for a specif part number, please include it with your message.